From elegant Danish watchmakers Skagen, this sleek ladies' timepiece boasts a stylish two colour finish. A gold tone case frames the crisp white dial, contrasted beautifully with the silver tone of a stainless steel mesh bracelet. Finished with subtle crystal hour markers, this quartz powered watch promises both style and function to the highest degree. 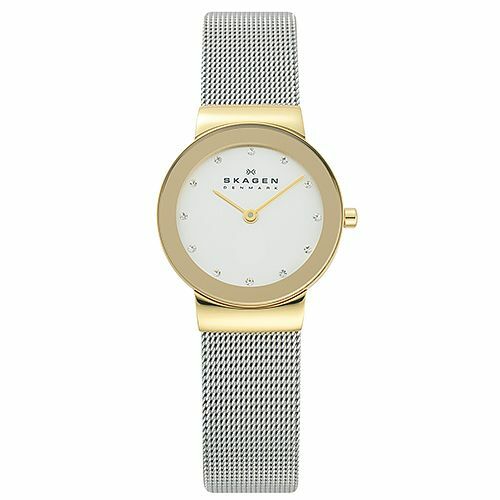 Skagen Freja Ladies' Two Colour Mesh Bracelet Watch is rated 5.0 out of 5 by 2. Rated 5 out of 5 by Anonymous from This watch is very stylush I would recommend this watch as it's suitable for both day & evening wear, goes with any colour jewellery as got a gold dial & silver strap with small crystals instead of numbers. Strap is easily adjusted to fit any size wrist. Would definitely recommend. Rated 5 out of 5 by Anonymous from Beautiful collection, absolutely in love with my watch ! Would definitely recommend this brand! Such a lovely design and adjustable fits so nicely!